Match action from Worksop v Clipstone. Pics by Andy Sumner. 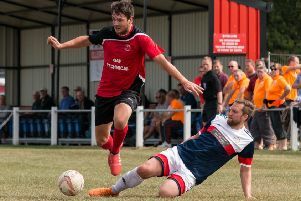 Clipstone manager Jamie Hardwick was frustrated after two early goals sent bottom-of-the-table Clipstone on their way to a 3-0 defeat at Worksop Town. The Tigers, under new management team Duncan Millgan and John Buckley, were 2-0 up after 11 minutes. Mitch Husbands struck the first from six yards in the ninth minute and two minutes later Charlie Baird slotted in a neat second. Steve Woolley completed the scoring in the second half with a tap-in as the Tigers took the Northern Counties East League Premier Division points. Hardwick said: “I am just disappointed with the goals — and not very good goals — we gave away so early. Straight away we were on the back foot chasing the game. “We gradually did get into the game. We changed our shape and we had quite a lot of possession. Clipstone squandered two good chances late on when they trailed 3-0. “The positive was our style of football,” added Hardwick.